Do you like a challenge? Do you relish meeting and exceeding goals? Do you love to accomplish things that others think are impossible? There is a whole movement in the world of athletics referred to as Extreme Sports. It involves everything from sky diving to skate boarding to motor cycle jumps and bicycle tricks. It is all dangerous, even life threatening. Some of it makes the stunt men and dare devils of yester-year seem tame and boring. Our movies, video games, and other forms of entertainment give us an escape into fictitious worlds where the everyday man does the impossible. Heroes and villains have super powers, do battle while hovering in the air, and never really die. When the screen says “Game Over” all we have to do is hit reset. People love to push the envelope and reach for the outer limits. It seems to be in our nature – that drive to excel and exceed and work our way past boundaries. To go where no one has gone before. But in that pursuit of the impossible there are limits. There are boundaries that cannot be crossed no matter the technology, ability, power, or prowess of man or machine. There are laws of nature and absolute truths that can never be undone. Yet we try. We do not believe that anything is set in stone or that there is a rule with no exceptions. One illuminating example of this drive to do the impossible can be seen all around us. There is a simple way for us to experience this for ourselves. Today or tomorrow try this at work or at school. Ask someone if they believe in God. If they say yes, ask them if they believe in heaven. If they also say yes, ask them if they think they are going to heaven when they die. You might get a no answer right from the start, but more than likely you will find that most people deep down will admit that they believe in God and heaven and that they are going to go to heaven when they die. Ask why they think they are going to heaven and you will probably be astonished by the poor theology, philosophy, and emotionalism that drives their thinking. People play an extreme spiritual sport every day that they claim to believe in God and heaven and think that they will go to heaven when they die while at the same time denying the gospel of Jesus Christ. You see, on our own we naturally do not want to admit that we are sinners, much less that we are doomed to hell. After all, doesn’t everyone go to heaven when they die, except of course people like Hitler? The extreme part of this spiritual sport is seen in the truth that the Bible tells us that “without faith it is impossible to please God.” Simple. Straight forward. Easy to understand. If we do not have faith, we cannot please God. No matter what else we do, believe, sacrifice, pray, think, attempt, or say, if we do not have faith we will not ever please God. The Bible is equally clear that those who do not please God will not have fellowship with Him in heaven but will suffer under His wrath for all eternity in hell. Here is a boundary, a line that cannot be crossed, a rule that never changes no matter how hard we want it to change. 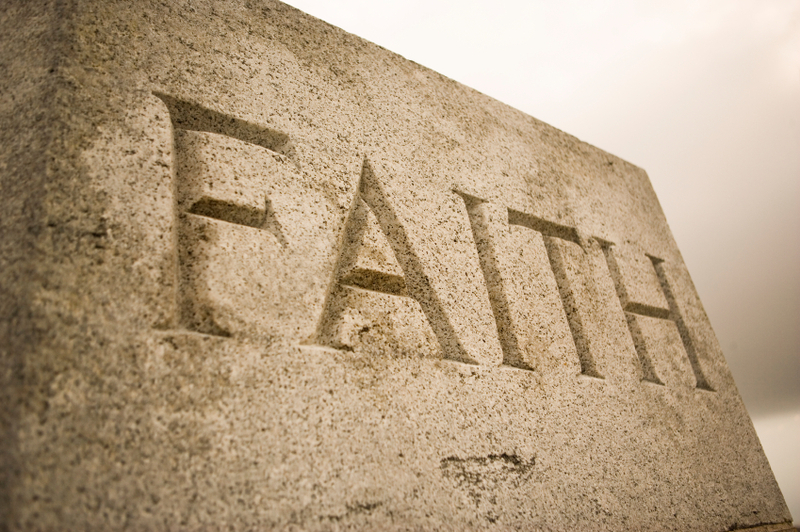 God is not and will not be pleased with us unless we have faith. It is impossible. Why is this an impossible mission? I’ll give you three reasons. First, because of Who God is. He is God. He is Holy. He has declared that to please Him we must have faith in Him. Second, because without true saving faith we cannot be right with God because the debt for our sin is too great for us to pay. Faith is the means whereby He has established a reconciliation between Him and us. No faith, no reconcilation. Third, because if we do not have faith we will not desire to have a relationship with the God of the Bible anyway. In our human nature we often create images of God to suite our own needs, wants, and desires. We make God in our image instead of confessing that we have been made in His image. We want a God who is a grandfather, a genie, and a winning slot machine all wrapped into a non-threatening package that loves and accepts and blesses us no matter what we do or think or say. The God of the Bible is Holy, Holy, Holy. He has stated clearly that if we go through this life without faith in Him then no matter how extreme a life we live we will never be able to please Him. Want to please God? Take Him at His Word. Believe Him. Trust Him. Have faith in Him. And what is the proof of real, saving faith? See Galatians 5:22-23 for starters. Join us this Sunday, April 17, at 10:30 AM for worship. In our next message from Hebrews 11 we will take time this week to look at “Highlights from the Hall of Faith”, reviewing a few central points from the series before we complete it with a look at Hebrews 12:1-2 on Resurrection Sunday.